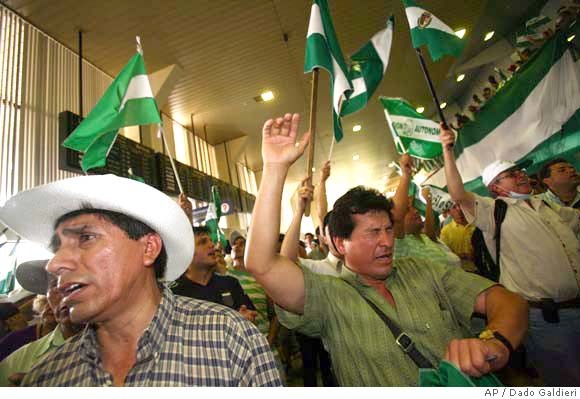 (10-28) 04:00 PDT Santa Cruz, Bolivia --Bolivia Troubling fissures have appeared in Bolivia's politics that make some fear the nation may be headed for a nasty breakup. In recent months, there have been several showdowns between residents of the eastern lowlands and President Evo Morales, the nation's first indigenous president since the Spanish conquest. Morales aims to redistribute the nation's wealth from the east to the western provinces inhabited by the nation's indigenous majority. they attempt to retake the airport from the troops. (right) Riot police disperse demonstrators. 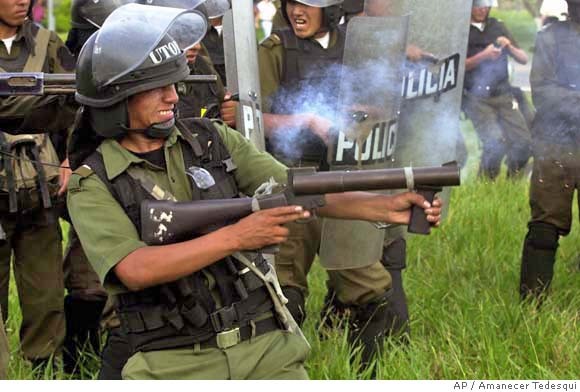 Just this month, thousands of residents of Santa Cruz, Bolivia's wealthiest eastern city, seized Bolivia's busiest airport from soldiers sent by Morales. Airport workers, who had demanded the cargo handling fees that are paid monthly to the national airport authority, had threatened to block flights, which precipitated Morales' sending in troops. Santa Cruz Gov. 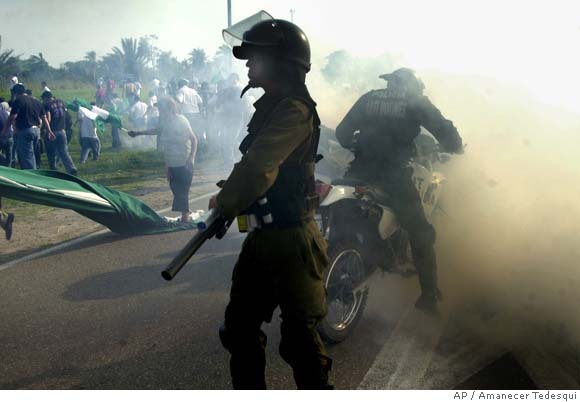 Ruben Costas called on residents to retake the airport and thousands responded, waving green-and-white Santa Cruz flags. Also this month, O Globo, one of Brazil's largest newspapers quoted an anonymous Santa Cruz state official bragging that a 12,000-strong anti-Morales militia was hidden in the jungle, awaiting the right time to strike against the government. And last month, thousands of protesters took to the streets in Sucre to push for the city to become the full-fledged capital of Bolivia as it was before a civil war in 1899 moved the executive and legislative branches to La Paz, 250 miles away. Afterward, some 10,000 Morales supporters arrived, chanting "Death to those who want to divide the country." Since Morales, a 47-year-old Aymara coca farmer and union leader, assumed power in January 2006, he has attempted to wrest control of the east's natural gas fields to develop the western highlands. The Altiplano, as the region is called, is inhabited by Aymara and Quechua Indians, who make up 55 percent of the country's 8.2 million population. The majority live below the poverty line in a country with an annual per capita income of $3,100. As the economic center has migrated eastward in recent years, deep-rooted racial rivalries have intensified the regional split, many analysts agree. Jim Shultz, director of the Democracy Center, a nongovernmental organization based in the city of Cochabama, likens Bolivia's current political environment to the first years after Nelson Mandela became president in South Africa, replacing the apartheid government. "We have seen historic cultural, ethnic, political and economic differences between the largely indigenous western highlands centered in La Paz and the more European, mixed-race flatlands centered in Santa Cruz erupt into a battle of wills that threatens political deadlock," Shultz said. "We are seeing a series of political aftershocks following the earthquake of his (Morales') election." Santa Cruz, which is the agricultural hub of Bolivia, wants more autonomy from La Paz and a larger share of the natural gas revenues it generates. In short, provincial officials are irate over Morales' attempt to centralize power and focus on indigenous rights. When eastern politicians called for greater regional autonomy, Morales produced plans for more indigenous and municipal autonomy that would circumvent regional power. "Morales' opponents hate him so much that they cannot see straight anymore," said Shultz. To institutionalize indigenous rights, Morales wants a new constitution that will guarantee indigenous representation in Congress, recognize their communal property and give the Aymara and Quechua decisional power over exploitation of natural resources on their lands. "Morales has taken the expectations of the excluded sections of Bolivia ... to look for a more equal and less unjust society," said former Hydrocarbons Minister Andres Soliz. But Santa Cruz's U.S.-style consumerism doesn't blend well with Morales' vision of a communal state ruled by the Indian majority. Last month, the president appeared on Comedy Central's "The Daily Show," denouncing capitalism as "the worst enemy of humanity." "Morales has brought great symbolic force and made an historic leap for indigenous people to feel part of Bolivian society," said former President Carlos Mesa. "Indigenous autonomy and political inclusion are positive, and we should celebrate them, but Morales has not realized that he is president of all Bolivia." Some political analysts say the east-west conflict may keep the so-called Constitutional Assembly, an elected body that is drafting the new constitution, from concluding its work by its Dec. 14 deadline. Some critics say Morales and his Movement Toward Socialism party will try to strong-arm the assembly into making the changes they want. "There cannot be a Constitutional Assembly when one side tries to dominate the other. ... No one will believe in it. No one will trust it," said La Paz historian Carlos Toranzo. But Horst Grebe, president of the La Paz think tank Prisma Institute, predicts political horse-trading eventually will produce a new constitution that will not include the institutionalization of indigenous power that Morales wants. "It will be an agreement with no deep constitutional reform, that does not please anyone but protects the country from institutional failure," he said. At the same time, many analysts doubt the political impasse will lead to civil war, banking on Morales to rely on his union background as a shrewd, pragmatic negotiator to arrive at a solution that benefits both sides. "Morales pushes to the limits to obtain what he wants," said Eleanor Murphy, an analyst at Control Risks Group, an international consultancy based in London. "His demands start very high and then he negotiates down." But historian Toranzo says continued political conflict could produce isolated acts of violence as indigenous protesters press for the government's program. "A failure of the Constitutional Assembly may serve as a trigger that could lead to battles between different interest groups," Toranzo said. "Never underestimate the ability of Bolivia to look like it is about to go over the cliff and not go over the cliff," he said.